In recent years, there has been much discussion about the crisis facing academic philosophy: fewer people are interested in either funding or pursuing philosophy as an academic discipline. As a result, many philosophy departments across the world have either downsized, or else shut down. In a 2011 article for The Chronicle of Higher Education, Lee McIntyre argued, “Unless systemic changes are made within the profession of philosophy over the next several years, we can expect that within a few decades, the entire discipline may be threatened.” Since the 1970s to the present day, The National Center for Education Statics in the United States reported a 20% decline in the study of philosophy at the university level. While the nature of the current crisis is self-evident, the cause as well as possible solutions have been a matter of fierce discussion within philosophical communities across the world. 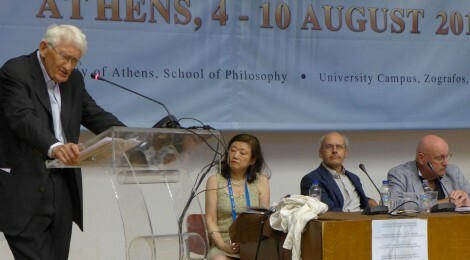 In the context of this on-going debate, from August 4 to August 10, 2013, academic philosophers from across the world met in Athens, Greece to discuss “Philosophy as Inquiry and Way of Life,” at the World Congress of Philosophy, organized every five years by Le Federation Internationale des Societés de Philosophie (FISP–The International Federation of Philosophy Societies). Established in 1948, FISP is a global association whose members are philosophical societies and other similar philosophical institutions at national, regional and international levels. The first World Congress took place in 1900 in Paris. This year, the 23rd World Congress collected some 3000 philosophers from over 100 countries at the University of Athens’ School of Philosophy with a schedule of events that spread over 80 plus A4 pages. Additional events were held at historic locations across the city including Opening Ceremonies at the Odeum of Herodes Atticus, and panels at the purported site of Plato’s Academy, Aristotle’s Lyceum and Pnyx–the historic forum of the original Athenian democracy. The conference consisted of Plenary Sessions and Endowed Lectures featuring philosophers with global readership, including Jürgen Habermas and Umberto Eco, Invited Sessions and Symposiums presented by established philosophers, special sessions organized by philosophical societies, Contributed Paper sessions featuring professors of philosophy, Student Sessions and Poster Sessions. Many philosophers have been quick to blame the current decline in academic philosophy on deficits in the correct practice of current and traditional philosophy. Few have considered the impact of the content and composition of philosophy as a discipline. In bringing together a diverse cross-section of philosophers, the Congress offered an important opportunity for a bird’s eye view of the contemporary discipline, which shed light on some fundamental challenges facing the discipline. Philosophy remains a field dominated by Euro-American men and their particular geo-political concerns and perspectives. The strong dominance of analytic and continental methodologies in academic discourse precludes genuine diversity and rigorous engagements with alternatives frames of thought. 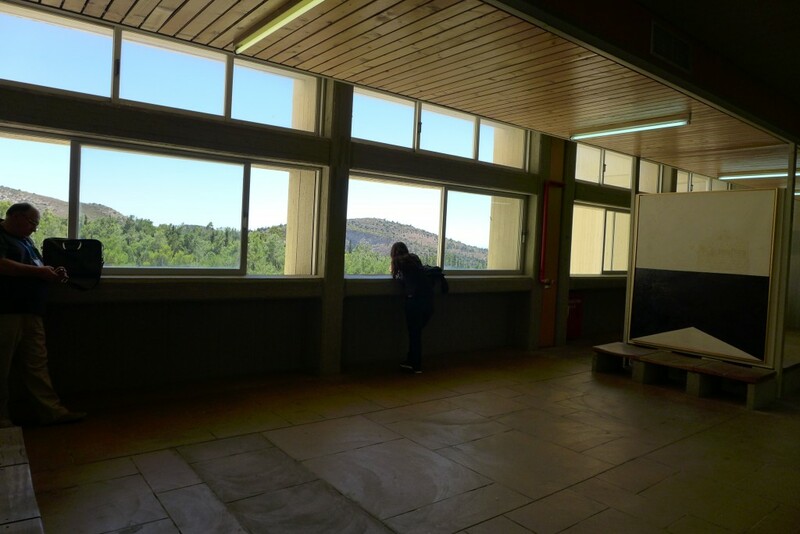 The tendency towards introversion, of philosophy as a discipline and philosophers as a community, is exacerbated by the isolating structures of the modern academy, which has widened the chasm between the philosopher–self-imprisoned in the academic ivory tower, and hard ground realities of the conditions of human life beyond these walls. Given the current challenges facing philosophy as a discipline, there was much debate about the nature of philosophy, its methods and its possible future directions. The very first Plenary Session of the Congress ended with a talk by John McDowell on “The Role of Argumentation in Philosophy.” McDowell presented a compelling definition of the field. He argued that anything could be “philosophical,” art, music, dance, culture. However, philosophy, as a craft, began with the construction of arguments that connect ideas or construct world views. This fine attention to argumentation is at the heart of philosophy, he suggested. “Philosophy is everything, but it begins with the study and generation of arguments to explain and account for phenomena and relationships between phenomena.” He spoke, further, about the ethics that should regulate philosophy: He argued for the need for the increased ‘inclusiveness of philosophy.” He argued against “the aggression of polemics,” which seeks to use complex languages to deliberately exclude and intimidate. He went on to mark certain standards of thought to which a philosopher must commit herself: a philosopher must be aware of contemporary and historic discourse in order to respect the time and attention of her fellows. She must not take credit for work that was not the product of her own creative reflection. However, not all philosophers would agree with McDowell’s understanding of philosophy as the craft of argumentation. Many would blame such conceptions for the current demise of the discipline and argue that reducing philosophy to argumentation renders it a servile tool to the whims of society. In a speech to the American Philosophical Association, the moral and political philosopher Alasdair MacIntyre argued that on such a view, “The professor of philosophy…stands to the contemporary bourgeoisie much as the dancing master stood to the nobility of the ancien regime. The dancing master taught the eighteenth-century expensively brought up young how to have supple limbs, the philosophy professor teaches their twentieth-century successors how to have supple minds.” Philosophy, many feel, must not be so restricted. If it is to thrive, it must enter into all areas of life. If it is restricted to mere argumentation, then it becomes nothing more than a sophisticated parlor game. However, philosophy’s capacity to enter into fundamental debates has been severely questioned by the advent of modern science. The issues that were traditionally under the purview of philosophical debate are now addressed in various scientific disciplines. Further, the search for truth and meaning can also be pursued through the natural sciences and mathematics. What role philosophy can play in this contemporary context is uncertain. Some suggest, as did W. V. O. Quine, that with the development of modern sciences, philosophy ceases to have any independent relevance, and that philosophy must merge with the natural sciences. In response to such criticisms, many philosophers have emphasized the importance of interdisciplinary work for the future of philosophy. In The Nature and Future of Philosophy Micheal Dummet argues, similarly, that the methods of scientific disciplines including physics, psychology and neuroscience must be integrated more seriously within the practice and methods of contemporary philosophy. Others suggest that philosophy is in decline because it has ceased to be relevant to contemporary concerns. Several reasons have been offered for this: the epistemic pre-eminence of scientific discourse (extending from the previous suggestion), current trends in philosophical method, the structures of the academy or the outdated/introverted work and methods of philosophers/philosophical pedagogy. In an article in Inside Higher Education Robert Frodeman, J. Britt Holbrook and Adam Briggle argue that philosophers should get creative and treat the question of who counts as our peers as itself a philosophic question. They suggest that the notion of the peer should be extended beyond the boundaries of the discipline. Interrogating the function of the academy further, McIntyre, argues that professors of philosophy need to remember what motivated them to pursue philosophy and channel these ideas into classroom pedagogy to encourage renewed interest in philosophy. Some philosophers question the role of the academy and academic practice all together, arguing that philosophy is about thinking and not research. The philosopher, they argue, has been reduced to the expert of secondary literature, and philosophy, as it is currently taught has been reduced to rote learning. Others still question whether philosophy should be considered a “discipline” at all.